Business leaders require actionable forward-looking intelligence to make strategic decisions. The Foundation-Keybridge U.S. Equipment & Software Investment Momentum Monitor consists of indices for 12 equipment and software verticals . These indices identify key turning points in their respective investment cycles with a 3 to 6 months lead time. Equipment and software investment data comes from the Bureau of Economic Analysis (Nonresidential Private Fixed Investment, chained dollars) and is publicly available on BEA's website on a quarterly basis. The underlying Momentum Monitor data comes from other publicly available sources (published monthly), including BEA and the Census Bureau, and is used to calculate the Momentum Monitor indices. Investment in Agricultural Machinery increased 27% (annualized) in Q4 2018 and is up 13% from one year ago. The Agriculture Momentum Index held steady at 86.1 from March (revised) to April. The Agricultural Price Index for All Crops rose 8.5% in February, but Soybean Futures fell 2.2% in March, the eighth decline in the past year. 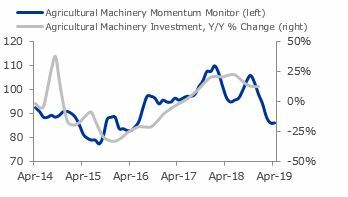 Overall, the Index continues to point to slower growth in agricultural machinery investment over the next three to six months. Investment in Construction Machinery contracted at a 0.9% annual rate in Q4 2018 but is up 7.6% year-over-year. The Construction Momentum Index declined from 92.2 (revised) in March to 90.6 in April. In February, Non-Residential Construction Spending edged down 0.5%, while Existing Homes For Sale increased 2.5%. 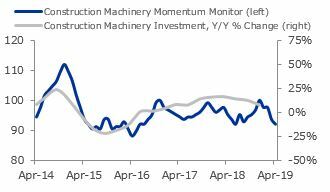 Overall, the Index points to weaker and potentially negative growth in construction machinery investment over the next three to six months. Investment in Materials Handling Equipment rose at a 0.6% annual rate in Q4 2018 and is up 4.8% year-over-year. The Materials Handling Momentum Index fell from 96.2 in March to 95.5 in April. Inventories of Materials Handling Equipment declined 1.1% in January, while Earnings in Materials Handling Equipment Manufacturing edged down 0.3% in February. Overall, the Index points to continued modest growth in materials handling equipment investment over the next two quarters. Investment in All Other Industrial Equipment rose at an 8.3% annual rate in Q4 2018 and is up 4.6% from a year ago. 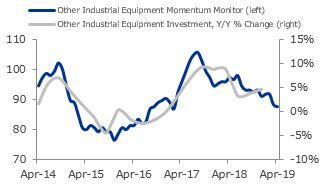 The Other Industrial Equipment Momentum Index eased from 88.1 (revised) in March to 87.4 in April, its lowest reading since February 2017. In February, Capacity Utilization for Electrical Equipment Manufacturing fell 0.6 percentage point to 74.9%, while Industrial Production for Total Machinery declined 1.8%. 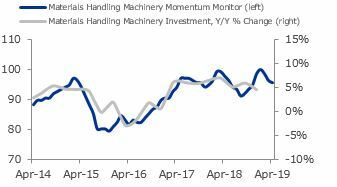 Overall, the Index continues to point to weak and potentially stalled growth in other industrial equipment investment over the next three to six months. Investment in Medical Equipment expanded at a 2.4% annual rate in Q4 2018 and is up 6.2% year-over-year. The Medical Equipment Momentum Index held steady at 87.7 from March (revised) to April. The Consumer Price Index for Hospital & Related Services decreased 0.6% in February, while the S&P 500 Health Care Index fell 0.7% in March. 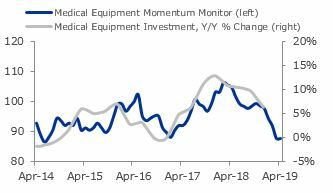 Overall, the Index points to further slowing in medical equipment investment growth over the next two quarters. Investment in Mining & Oilfield Machinery declined at a 15% annual rate in Q4 2018 and is also down 15% year-over-year. The Mining & Oilfield Machinery Momentum Index held steady at 102.5 from March (revised) to April. Capacity Utilization for Petroleum & Coal Products dropped 4.2 percentage points to 78.8% in February, but Mining & Logging Employment rose 0.5% in March. 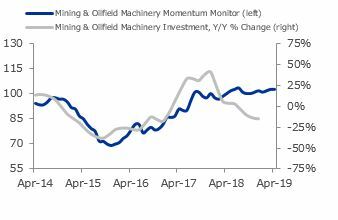 Overall, the Index points to a potential improvement in mining & oilfield machinery investment over the next three to six months, though a strong rebound is unlikely. Investment in Aircraft surged 59% (annualized) in Q4 2018 and is up 20% on a year-over-year basis. 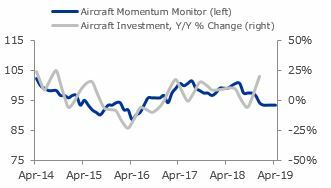 The Aircraft Momentum Index remained at 93.4 from March (revised) to April. Mexico Air Traffic surged 34% in December, its third straight double-digit increase, but Exports of Computers and Electronic Products fell 9% in January. Overall, the Index points to moderate growth in aircraft investment over the next two quarters. Investment in Ships & Boats declined at an annual rate of 5.9% in Q4 2018 and is down 6.7% year-over-year. The Ships & Boats Momentum Index declined from 107.0 (revised) in March to 104.3 in April. In February, Houston Shipping Container Traffic dropped 7.7%, its fourth straight decline, while the Producer Price Index for Ship and Boat Building rose 0.2%. 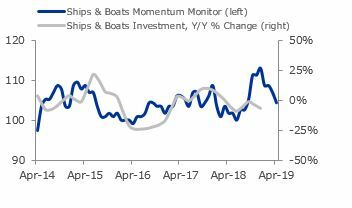 Overall, the Index points to continued weakness in ships and boats investment over the next three to six months. Investment in Railroad Equipment surged at a 20% annual rate in Q4 2018 but is down 6.2% year-over-year. The Railroad Equipment Momentum Index fell from 92.5 in February to 88.8 in March. In January Rail Carloads of Petroleum Products declined 15%, and Rail Carloads of Metallic Ores & Metals dropped 27%, its steepest decline in more than four years. 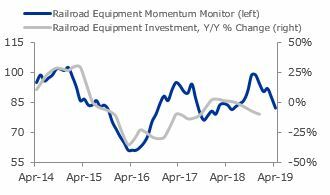 Overall, the Index points to continued weakness in railroad equipment investment growth over the next three to six months. Investment in Trucks rose at a 6.7% annual rate in Q4 2018 and is up 10% from year-ago levels. 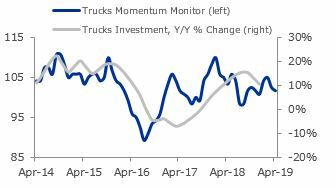 The Trucks Momentum Index slipped from 102.5 (revised) in March to 101.6 in April. In February, Capacity Utilization for Furniture Manufacturing declined 1.4 percentage points to 76.2%, but Industrial Production for Motor Vehicles rose 2.2%. Overall, the Index points to moderate growth in trucks investment over the next three to six months. Investment in Computers fell at an annual rate of 15% in Q4 2018 but is up 5.4% year-over-year. The Computers Momentum Index edged up from 102.5 (revised) in March to 103.3 in April. Shipments of Communication Equipment ticked up 0.3% in February, while Industrial Production for Computer & Electronic Product Manufacturing rose 1.6%. 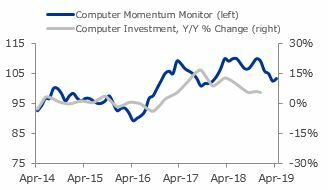 Overall, the Index points to modest growth in computers investment over the next two quarters. Investment in Software rose at a 10% annual rate in Q4 2018 and is up 12% year-over-year. 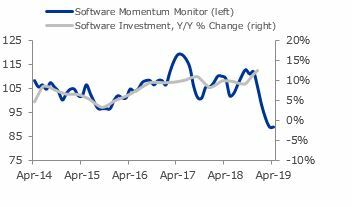 The Software Momentum Index held steady at 88.9 from March (revised) to April. Microsoft’s Market Cap declined 1.3% in February, and the Total M1 Money Supply contracted 0.2% in March. Overall, the Index continues to indicate a slowdown in software investment growth over the next three to six months.